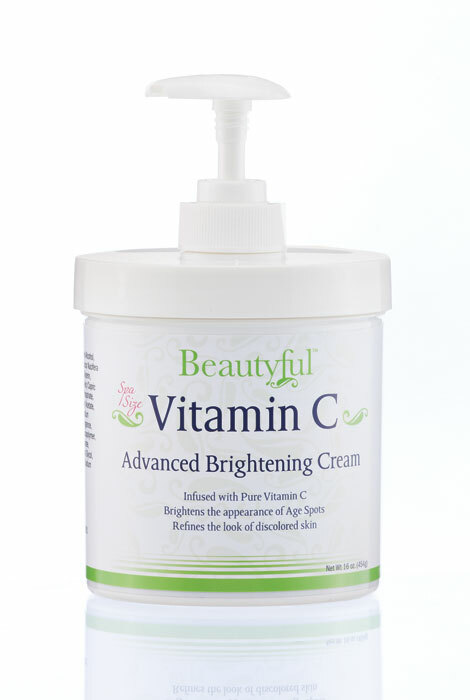 Brighten the appearance of your skin with the power of Vitamin C. Beautyful™ Vitamin C Advanced Brightening Cream refines the look of discolored skin and fights the appearance of age spots. Infused with pure vitamin C and enriched with ferulic acid and vitamin E, this formula for face, neck, hands and body also contains soothing aloe leaf juice and coconut oil for maximum results. The large spa-size container is convenient and offers a fantastic value. The built-in dispensing pump makes it easy to keep your skin bright and refreshed. To use, apply daily onto cleansed skin and massage into skin until fully absorbed. Compare at $60! Water (Aqua), Cetearyl Alcohol, Mineral Oil, Glyceryl Stearate SE, Aloe Barbadensis Leaf Juice, Cocos Nucifera (Coconut) Oil, Isopropyl Myristate, Glycerin, Butylene Glycol, Ceteareth-20, Caprylic/Capric Triglyceride, Aminopropyl Ascorbyl Phosphate, Tetrahexyldecyl Ascorbate, Tocopheryl Acetate, Camellia Sinensis Leaf Extract, Disodium EDTA, Ascrobic Acid, Ferulic Acid, Fragrances, Acrylates/C10-30 Alkyl Acrylate Crosspolymer, Sodium Polyacrylate, Ethylhexyl Stearate, Trideceth-6, Phenoxyethanol, Caprylyl Glycol, Ethylhexylglycerin, Hexylene Glycol, Sodium Hydroxide. Apply a sufficient amount of cream onto cleansed face, neck and body. Gently massage into skin until fully absorbed. Use daily. I've ordered it before, and I liked it. The price is right for a brightening Vitamin C cream. Great for the skin. I am hoping it will be as good as the other products . To see if it helps with age spots on my arms. Wanted to try a new hand cream.......price was right. Looking for facial, body creams for dry skin, and for wrinkled skin. I am a 66 yr old - skin getting darker with spots. Want to see if product will lighten my skin. This a a great product. I love it. My sister tried it and fell in love with it also.